Which NFL players could make Roger Federer-like run? 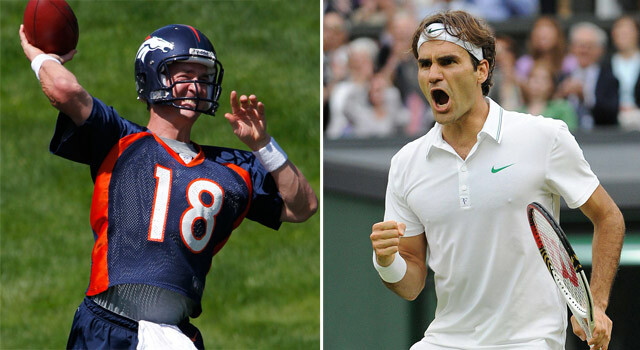 Published: July 6, 2012 at 06:52 p.m.
Can Peyton Manning make a late-career run to the Super Bowl like Roger Federer's march to the Wimbledon final? I'm a closet tennis fan. Huge one. It's unclear when it became uncool to like professional tennis -- the lack of good American men doesn't help -- but this is not a popular obsession at the NFL offices. For dorks like me, Sunday's Wimbledon final is as good as it gets until Week 1. The greatest champion in the greatest era the sport has ever seen, Roger Federer, will attempt to win one last Grand Slam title. It got me thinking on this slow July football day: Who would be the NFL equivalent? Which NFL all-time greats would I like to see on the biggest stage before their career is through? 1. Peyton Manning: No starting quarterback has ever won the Super Bowl with two different teams. It would be an incredible moment if Manning could lead the Denver Broncos to the brink with John Elway looking on. 2. Randy Moss: We had our doubts, but it looks like Moss has a good chance to make the San Francisco 49ers. It appeared that Moss caught the game-winning touchdown in his only Super Bowl appearance before he got Tyree'd. It would be cool to see one of the sport's most talented, smartest players reach the summit again. 3. Larry Fitzgerald: OK, he's not at the very end of his career, but I remember interviewing Fitzgerald after his Super Bowl defeat and thinking how difficult it would be for him to get back. He may not be that young but any return trip by the Arizona Cardinals would feel like a miracle. 4. Tom Brady: Yeah, he was there last year. But he's 35 years old, and the odds on Brady getting another chance isn't that high. Reaching a sixth Super Bowl after last season's heartbreak would say a lot about Brady's unique place in the game's history. 5. Ray Lewis and Ed Reed: Lewis has his ring. Reed, one of the greatest safeties of all time, has not had his chance in the big game. It would be very cool to see these two go out on top, Bettis-style.